In Båstad there will be a kiosk with limited range of sandwiches, pastries, cakes and sweets and also coffee, tea and cold drinks. Food is offered only in the form of field lunch served in partnership with Restaurant Sand. The menu for Saturday. At Vallåsen we offer a canteen with coffee, tea and cold drinks, sandwiches, pastries, cakes and sweets, as well as a barbecue with hot dogs and hamburgers. Field lunch is served in Vallåsens restaurant. Menu for Sunday. Field lunch must be pre-ordered through Eventor latest at Sunday, April 20. During the past weekend, in a brilliant spring sun, the Race Committee visited our two arenas, together with speaker Per Forsberg. The entire arena layup was reviewed and the final details were approved. The challenge for Saturday’s arena in Båstad has been to find a good flow because much of the facilities are already in place at the tennis stadium and cannot be moved. It will be a great arena in a small area with plenty of space for spectators to follow the elite runners in close proximity from any of the 6,000 seats in the grandstand. Sunday’s arena at Vallåsens ski resort offers proximity to everything, parking as well as showers and canteen. It will also be great opportunities to follow both elite runners and club members (tired?!) heading towards goal after the hard climbs in the forests. Now we just hope that the sun will shine just as much during the race weekend and wish you a warm welcome to Båstad and Vallåsen. During both the sprint in Båstad and long distance race at Vallåsen you will be able to follow the elite runners on a widescreen in the arena. It is Dala Storbild who has been commissioned to do the media production, which will feature both GPS tracking and live photos from the forest. If you are not able to be on site, there is also the opportunity to follow the races online. 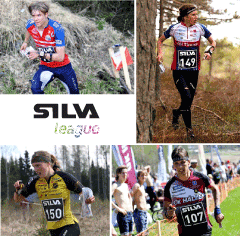 We in Hjärnarps GH OL have been contracted to stage races two and three in Silva League 2014. It is with pride that we look forward to implementing this arrangement, and we hope to collect much of the global elite runners for two days. Day one, Saturday, April 26, is a city sprint in Båstad, the metropolis of tennis, with arena in the area around the tennis stadium. Day two, Sunday, April 27, there will be a long distance race on Hallandsås north side with arena at Vallåsen ski resort. Both days there will be contests for other orienteers in the same areas and arenas. Map makers and course setters will do their very best to make it the best possible and decisive contests. You will hopefully be invited to incipient spring greenery during these two days, but we make no guarantee of this. Hjärnarps GH OL has previously arranged Swedish Championships, World Cup test, 5-nations, elite competitions, Silva J-cup etc. Welcome to Bjäre and Hallandsås 26-27th april 2014.